Ciao Tutti!!! I know I have been out of touch lately, but I have morphed into a turtle this winter. Head tucked in, writing away and pretty much on my own. Sometimes I will toss a photo up on Facebook, but even that has been sporadic. I can’t blame the weather for my isolation since it is a balmy sixty degrees here in Tuscany and we have gone below freezing only twice this winter. It’s quite strange. Lovely but strange. Trees are budding and if we have a late freeze it’s not going to be good for the grape and olive productions. Fingers crossed that our non-winter continues. On the plus side my house is not an igloo this year and I have been taking advantage of the warm days with a lot of walks in the countryside. Cinder would have adored this balmy weather; I have keenly felt the loss of my beautiful girl over the last months. Aside from working on the next installment of my adventures here (40 pages in and counting! 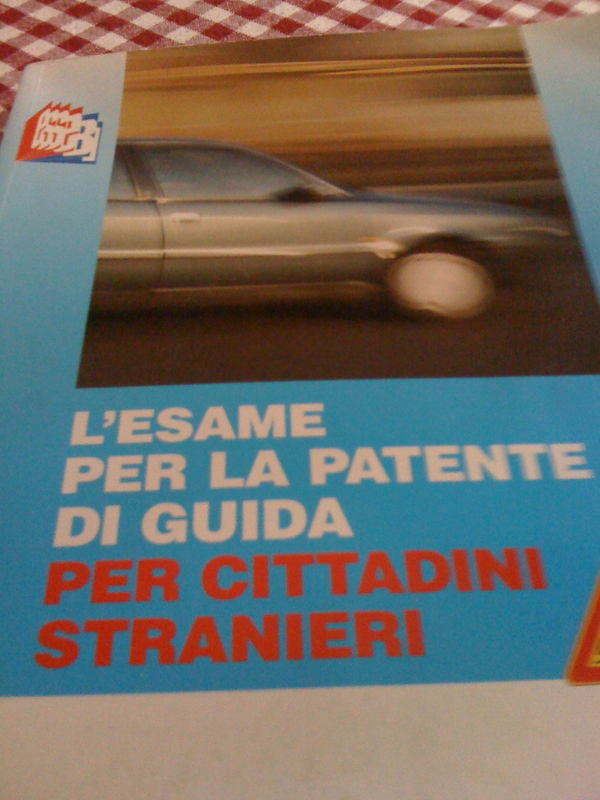 ), I am studying to get my driver’s license. Probably in most places of the world this would be a doable undertaking. However, here in my neck of the woods, the Italians have made the test so difficult that even they fail it two and three times. It’s going to be a challenge, especially since I studied for three days and then lost interest. I am determined to do a couple of hours today. My goal for this year is to buy a car. Hence the need for dedicated study before the season starts. Fingers crossed. I am about to start the third level of the sommelier course in March so I am looking forward to that. It’s been a really wonderful way to widen my circle of friends here. Wine lovers unite! 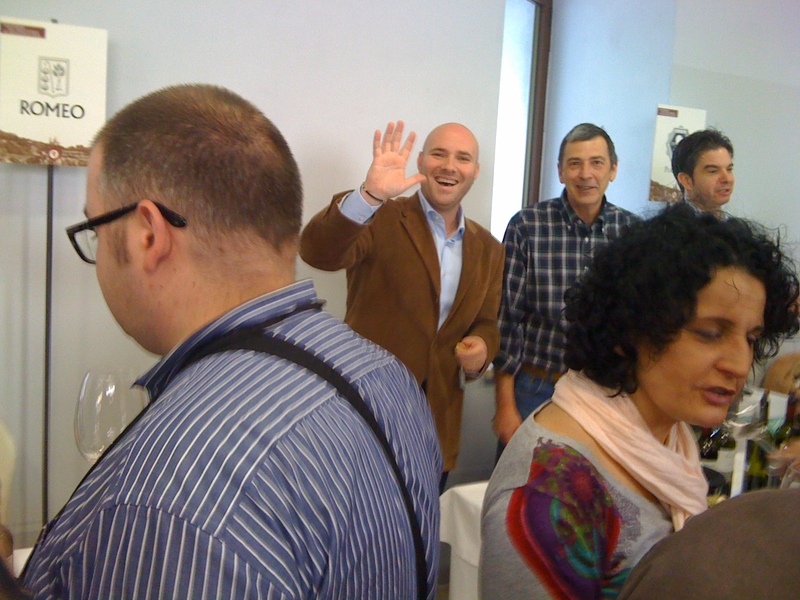 This past weekend was the anteprima di Vino Nobile where the new 2011 vintages of the vino nobile were presented. I may be slightly biased but the Poliziano 2011 is fabulous. I tried a lot of very good wines from other producers as well. We had a great turnout with over 40 producers participating. The event will end with a dinner tonight and then the journalists will come tomorrow and weigh in with their thoughts on this year’s offering. One more month and I will be back at work with Fabio at the winery for another season of tours and tastings. Until then I have my students for english lessons, which helps me get through the winter. I am also back in the kitchen with Marinella learning her recipes. I am planning to include some in the next book. And by the way, if you haven’t checked in with my publisher Gemelli Press lately, you should click on the link here and see what they have been up to. More Italian based books coming out this year and some hardcovers that are now available in paperback. Thanks to everyone who has supported At Least You’re in Tuscany. It now has over 100 great reviews on Amazon and I feel grateful for the love everyone has shown me and the book. The other good news for this year is that friends are finally starting to say they are coming to visit. I have two good friends planning trips and one of my aunts as well! April marks five years that I am here in Italy, so it will be so nice to finally see some friends and family from the States. 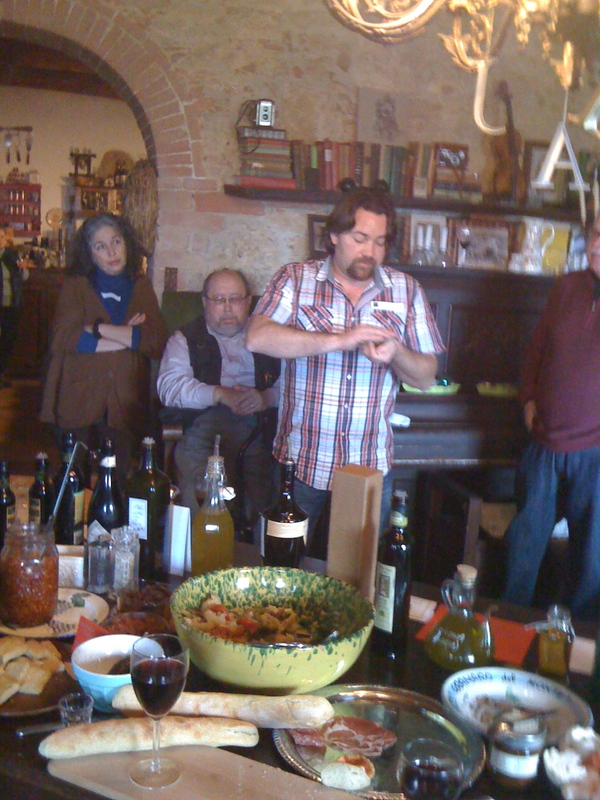 an olive oil tasting at cookbook author, Pamela Johns’ house. This is my friend Keith an olive oil sommelier who is instructing us on slurping oil! Marinella teaching me her ragù recipe! I helped out a bit too! 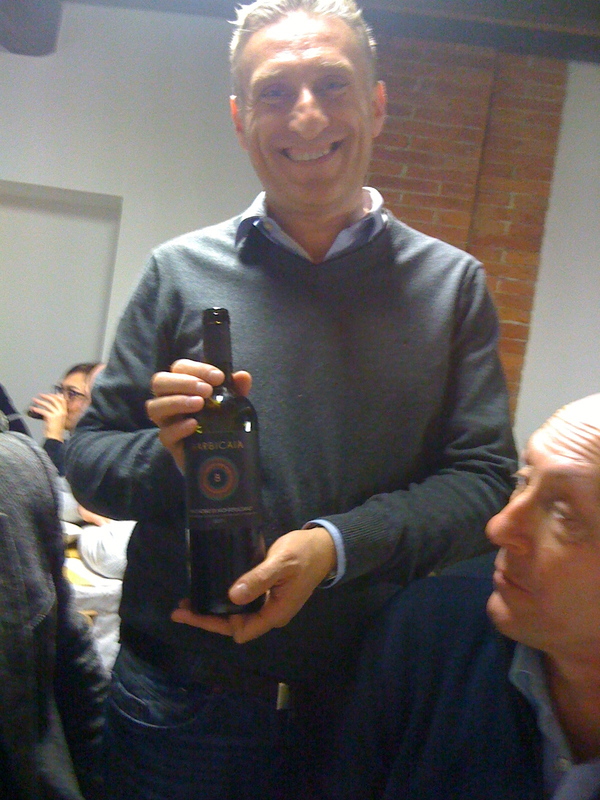 My friend Marco Barbi launched his first Vino Nobile vintage this year!! BARBICAIA!! 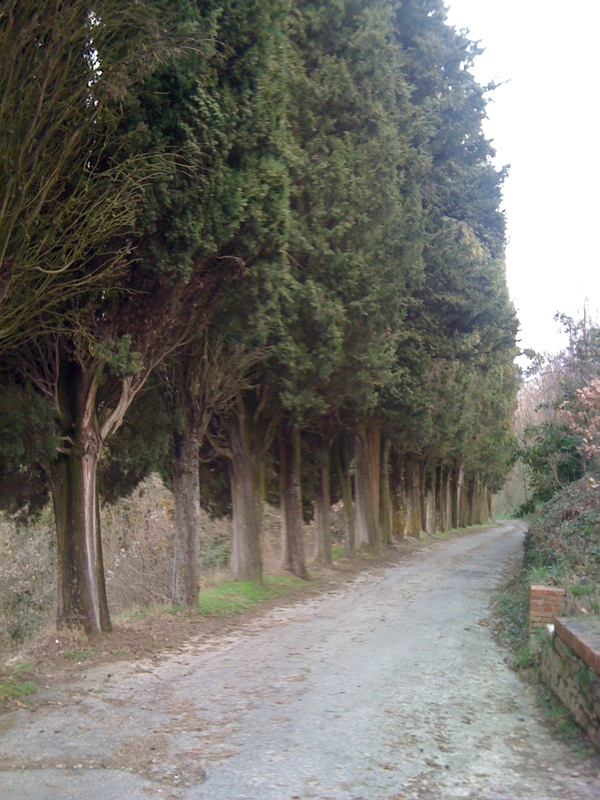 Tuscany is beautiful no matter the season! Jennifer, I took a tour with you with a group of friends a couple of years ago, Love your blogs and Ordered copies of your book for many of my friends. Thanks for making my day today, as I remember the beautiful times I have had in Italy! Ciao! And thank you Pam! Sorry to be so out of touch this past year. I appreciate you following along. I hope you will come back again and see me at the winery!!! And the biggest thank you for the support on the book. It is so so appreciated. If you or your friends have time to write a few words on Amazon, rave reviews are a big help since word of mouth is vital with a small publisher! Good to see you on line Jen. Looking forward to your next book. We are also experiencing a very warm, dry winter only we are not so happy about it. I love the weather but being almond, walnut farmers we desperately need water for our orchards. We have already lowered three of our wells. Take care and keep on enjoying your adventuresome life. I simply cannot wait for a sequel! It will be exciting to read how life has been since book one. I love your honest writing style. Good luck on the driving test and have fun with the course. This is Robert, My wife Julie and I visited you at Poliziano for a wine tasting last September.If you remember I stayed at Abergo Il Borghetto. The next time I will contact you about your friend who has a hotel that you recommended. It was so wonderful meeting you after reading your book At least your in Tuscany. I am looking forward to the sequel. I’ll be ordering some Vino Nobile soon, good luck with the driving test. Hope to see you soon. Michelle, thank you for always being so supportive on the writing. It is much appreciated!!! And Robert, I do hope you and Julie will come back for another visit. It was a lot of fun meeting you guys. And yes definitely will send you some hotel options when you are ready. I will be back in the winery soon and will send you a price listing etc for the new vintages!!! Sunny California is finally getting a little rain, the last 4 days. Our state is going to be in bad shape if it doesn’t continue. Uncle Gary and I are doing well and wish the best for you dear niece. Keep enjoying the adventure. Loved seeing that photo with Pamela and one of my favorite kitchens. 🙂 Does the winery have online reservations for tours? 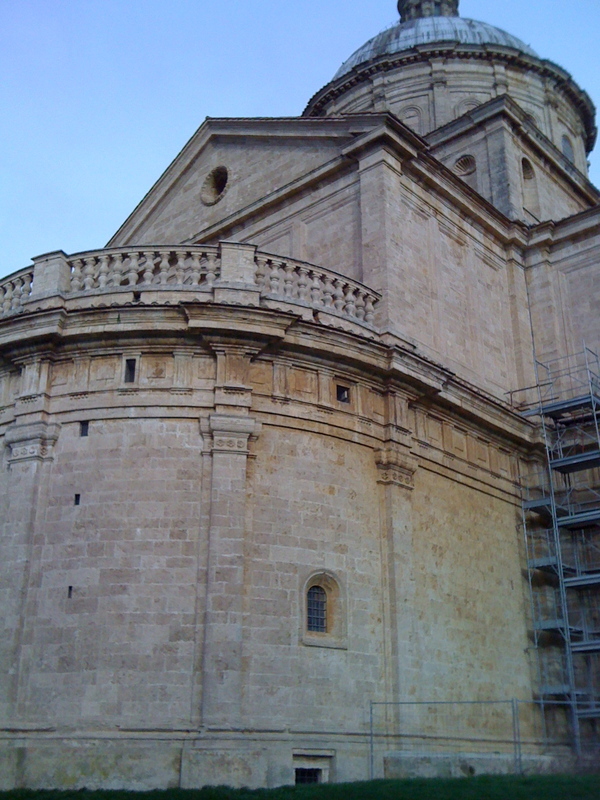 We’ll be in Montepulciano the week of 6/21 and would love to come check it out….and book specifically with you as a guide if that’s an option. So happy to hear another book is in the works! 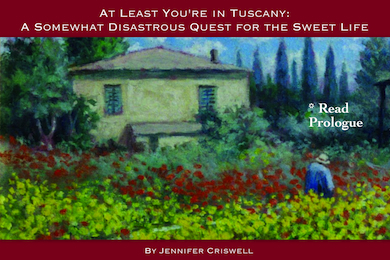 Hi Jenny, I just read your book on a Kindle while in Tuscany near Radicofani and much enjoyed it. You don’t delve into the wine rivalry between Montepulciano and Montalcino and I wonder if you have an opinion on the premier branding that Brunello tends to get compared to Vino Nobile? Hi Rebecca! You can send an email to accoglienza@carlettipoliziano.com. If you wait another week to book, I’ll be there to respond. The season is just about underway. Would love to do a tour for you guys! Thanks so much for the support on the book. If you have a moment to write a few words on Amazon, rave reviews are appreciated. As for the wine, I am by no means an expert, although I am enjoying my wine course! Montepulciano has about 70 producers of Vino Nobile as compared to about 200 Brunello producers in Montalcino. The rivalry is definitely amiable and each area passionate about their product. The wines are different in style as I am sure you know because of the different clones of the Sangiovese grape, micro climates, terrain etc in each area. I hope over time the Vino Nobiles will become as appreciated as the Brunellos and as well known throughout the world, as there are many wonderful wines here. And to my mind, many wines that rival if not surpass some of the Brunellos. Our consortium of Vino Nobile does a lot to get that message out and the anteprima of Vino Nobile in February had a good turnout from around the world, but there is definitely much more work to be done!!! !